[5 mins. 15 secs.] First up, the programming team behind the 2018 Brooklyn Film Festival, documentary programmer Julie Bridgeham and narrative programmer Jason Stefaniak. The festival, now in its 21st season, runs from June 1st through the 10th. Check out the website for remaining screenings, this weekend's BFF Exchange and more. [27 mins. 15 secs.] 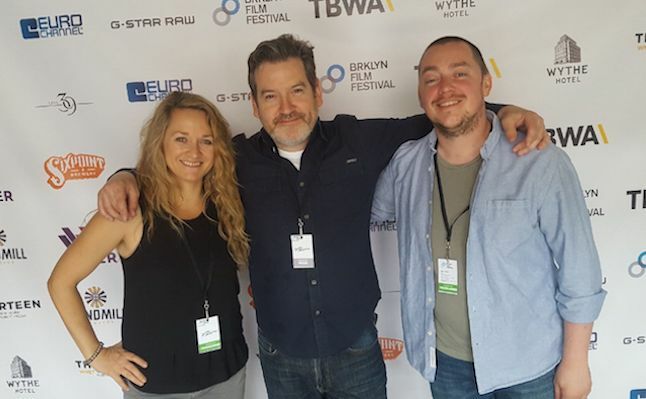 Then we welcome back to the podcast Rumur Films' filmmaker Michael Galinsky ("Battle for Brooklyn", "All the Rage") back for his 4th visit to the podcast. This time he's joined by David Beilinson, who along with Michael and co-director —and wife— Suki Hawley, made their current documentary, "Working in Protest", which had two screenings at the Brooklyn Film Festival earlier this week. We'll keep listeners apprised on how they can keep up with the film going forward. This episode of the podcast also celebrates the Northside Festival which takes place through this Sunday, June 10th. The interstitial music on this episode is entirely by musical artists performing at the festival including Soccer Mommy with her song "Your Dog", Parquet Courts with their song "Wide Awake", and Katie von Schleicher with her songs "Midsummer" and "Paranoia". For specific details about these performances and more, check out the full schedule on the Northside website.